Like giving Valentine's Day gifts, putting up festive decorations is another way to make Valentine's Day special. Today, I got to work to change our "Not-A-Mantel" to reflect the upcoming holiday. Back in December, I was inspired by The Lettered Cottage to create a Christmas Mantel. Of course, when January came around, it evolved into a Birthday Mantel. Now for February, we will have a Valentine's Day Mantel. To create this mantel, I kept the candles from Christmas and added a white teapot filled with silk roses. 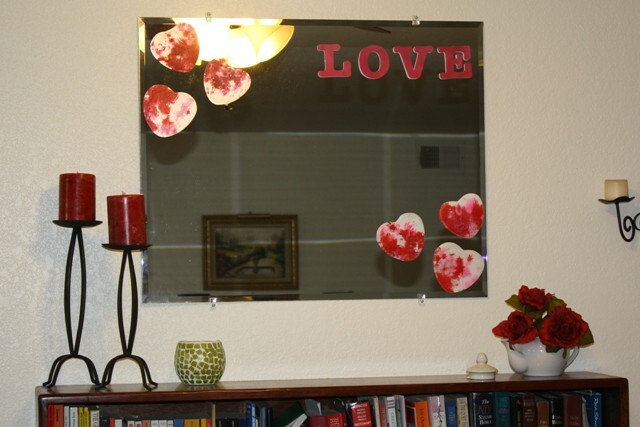 Then, I decorated the mirror with paper cutouts of the word LOVE and a few Crayon Hearts. I had aniticipated making these hearts with Ella, but she prefered to watch Swan Lake instead. Who am I to argue with her desire for culture? So, I made the hearts myself. I can only imagine that a child would love to do this craft too. Blow up a few balloons. You can either hang them up or just let the kids bat them around. There was a time when Ella declared "It's not a celebration without balloons!"